The Academy Awards are the most prominent film award in the United States. The Awards are granted by the Academy of Motion Picture Arts and Sciences, a professional honorary organization which as of 2003 had a voting membership of 5816, with actors, with a membership of 1311, making up the largest voting block. 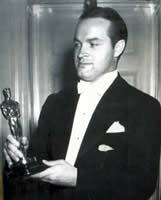 Academy Awards are nicknamed "Oscars", which is also the nickname of the statuette (the name is said to have been born when Academy librarian Margaret Herrick saw the statuette on a table and said: "It looks just like my uncle Oscar!"). The awards were first given at a banquet in the Blossom Room of the Hollywood Roosevelt Hotel on May 16, 1929 but there was little suspense since the winners of the awards had already been announced three months earlier on February 18. To qualify, a film had to open in Los Angeles during the twelve months ending on July 31 of the preceding year. The 1934 and later awards have all been based on openings in the previous calendar year. The 1932-33 awards were based on a 17-month qualifying period. The "opened in Los Angeles" clause allowed Charlie Chaplin to win his only voted Oscar for Limelight which was made in 1952, but did not open until 1972. The awards night itself is an elaborate extravaganza, with the invited guests walking up the red carpet in the creations of the most prominent fashion designers (who usually loan them to the stars to gain publicity). The awards ceremony is televised around the world. The 2004 awards ceremony will be produced by Joe Roth. The judging process and criteria for the awards themselves is the subject of much discussion. The Academy includes a preponderance of, as Charles Taylor, film critic for salon.com describes it, "elderly and (aesthetically) conservative" members. Certain genres of film, such as historical epics (and specifically ones about World War II), seem to appeal to the voters. There is also a wide belief that awards are given for "political" reasons - for instance, rewarding an artist whose career has included many good works but has not thus far received an Academy Award. Less subjectively, it is clear that movie studios spend large amounts of money on campaigns to get their films Oscars - Miramax being the most widely-discussed (and arguably successful) studio at this at present. Such influence is nothing new - it is widely believed that the early media mogul William Randolph Hearst ran a campaign to ensure that Citizen Kane, a film regarded by many as the greatest of all time - did not receive Oscars (it received only one, despite nominations in nine categories). For 2002, a new category, Best Animated Feature, was established. As of 2001, a film cannot appear on the Internet before its theatrical release and be eligible for an Oscar. In 2000 (and again in 2003), rules were tightened to restrict Best Picture nominations and awards to producers who actually functioned as producers. Up to three producers are allowed per film. The 1998 Best Picture Oscar went to five producers for Shakespeare in Love. Article text released under CC-BY-SA. It uses material from the Wikipedia article "Academy Award"